Have a look at the factsheets in the "related resources" box on this page. Image used: shutterstock_319861256. Image edited by Southampton University library. Reading as a writer (PDF): Learning how to read as a writer is a great way of improving your own writing. Source evaluation table (PDF): Helps to organise your thoughts and your research before you start writing. Note making (PDF): Making the most of your notes is a way of improving the focus and clarity of your writing. Annotated bibliography (PDF): This is a great way of engaging with sources in a critical way during the research phase. Freewriting (PDF) Try this excercise as a way of changing chaotic and disorganised thoughts into new and clear ideas. Outlining (PDF): Helps you to structure your assignment and retain your focus throughout the process of writing. Refining thesis statements (PDF): Refine your thesis statement to maintain focus and clarity in your writing. Reverse outlining (PDF): Get to grips with the structure and focus of your paper by reverse outlining. Introductions (PDF): A quick look at how to write and structure an effective introduction. Paraphrasing (PDF): Avoid plagiarism by learning how to paraphrase in a clear and accurate manner. Proofreading (PDF): Learn how to edit and proofread your own work before submission. Writing Paraphrases – University of North Carolina. Students often struggle with this. Planning and Preparing to Write Assignments – University of Nottinghham. 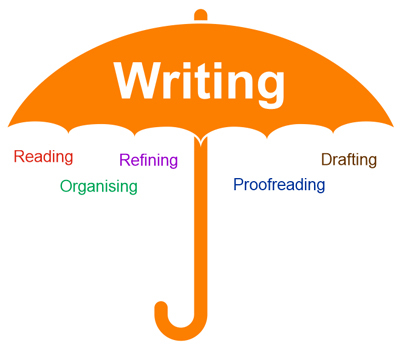 Covers various the various skills involved in writing an essay, and has a useful list of essay terms as well! Writing Handouts - University of North Carolina. Covers lots of skills (with videos!). Proofreading: the basics This session explains the differences between editing and proofreading. It will focus on giving practical tips for proofreading your written work to pick up errors in spelling, formatting, punctuation etc. There are opportunities to pause the recording and practice some of the techniques you have learnt via some short activities within the session. This is a Panopto recording of a Library Skills for Success workshop.